When working on a sewing project, you will want to have a bobbin full of thread in the appropriate color for what you’re making. It’s possible to wind thread onto a bobbin by hand, however this method is extremely time-consuming and does not wind the thread as tightly as a machine can. Loosely wound thread results in less thread fitting on the bobbin, and if it’s very loose, it may get caught in your machine, causing a lot of frustration later on. Luckily, Singer sewing machines are able to quickly and neatly wind your bobbins for you with only a minimal amount of preparation. Place a spool of thread in your chosen color onto the spool pin at the top of the machine. Slide the spool holder onto the pin; this will hold the spool securely in place and prevent the thread from becoming tangled as it’s pulled. Put an empty bobbin onto the bobbin pin, located at the top right of the machine. Before you proceed, disable the sewing needle from moving, either by pushing the bobbin pin all the way to the right or by pressing the indent on the hand wheel. The method required for your machine will depend on what model you have, but all Singer machines use one or the other. Pass the thread from the spool through the thread guide, which is located to the left of the spool holder. 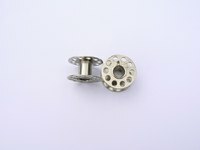 Depending on your machine model, there may be a second thread guide located in front of the first one. After the thread has gone through the thread guide(s), pull the thread over toward the bobbin pin and pass the end of the thread up through the small hole in the top of the bobbin. Step gently on the machine’s presser foot to begin slowly winding thread onto the bobbin. Hold on to the end of the thread until it has wound around the bobbin a few times; you can then let go once it is secure and increase your pressure on the presser foot to speed up the winding. The winding will stop automatically when the bobbin is full. Cut the thread and remove the bobbin from the bobbin pin. Disengage the lock on the needle by pressing the hand wheel indent again or pushing the bobbin pin all the way to the left. You can then insert the bobbin into its case, thread the machine, and begin sewing.